You are here: Home / Events / Show Your Business at Taste of Dublin – for FREE! Show Your Business at Taste of Dublin – for FREE! Bank of Ireland has launched its ‘Show Your Business at Taste of Dublin’ competition which offers one lucky food or beverage business the chance to win a stand at this year’s festival from the 16th to 19th of June. In addition to showcasing alongside some of Ireland’s best known brands, the winning company will exhibit to more than 34,000 foodies expected attend the festival over four days. Bank of Ireland has launched its ‘Show Your Business at Taste of Dublin’ competition which offers one lucky food or beverage business the chance to win a stand at this year’s festival from the 16th to 19th of June. Visit bankofireland.com/tasteofdublin for more information and to enter the competition. Deadline for entry is Wednesday 23rd March. 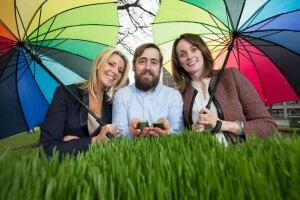 Pictured with trays of his vibrant organic wheatgrass are former competition winner Marty Brennan from My Organics with Avril Bannerton, Managing Director at Taste of Dublin and Emer McDonnell, Marketing Manager, Business Banking at Bank of Ireland. To enter, businesses fill in a short application form at www.bankofireland.com/tasteofdublin answering a simple question about the Taste of Dublin festival and outlining why their business should win a stand. The closing date for entry is Wednesday 23rdMarch. A panel of industry experts will shortlist entries to five businesses. Bank of Ireland will work with each of the finalists to shoot a video in which they sell their ‘menu’ for Taste of Dublin for the final stage of the competition which comes down to an online public vote. The videos will be shared and promoted through the Bank’s online channels from the 5th April, with the finalists encouraged to rally support from the public. The overall winner will be revealed on the 19th April, 2016. Visit bankofireland.com/tasteofdublin for more information and to enter the competition. Deadline for entry is Wednesday 23rdMarch.